Quantum Leap was a TV series in the late 80’s and early 90’s staring Scott Bakula who is now the star on NCIS: New Orleans. 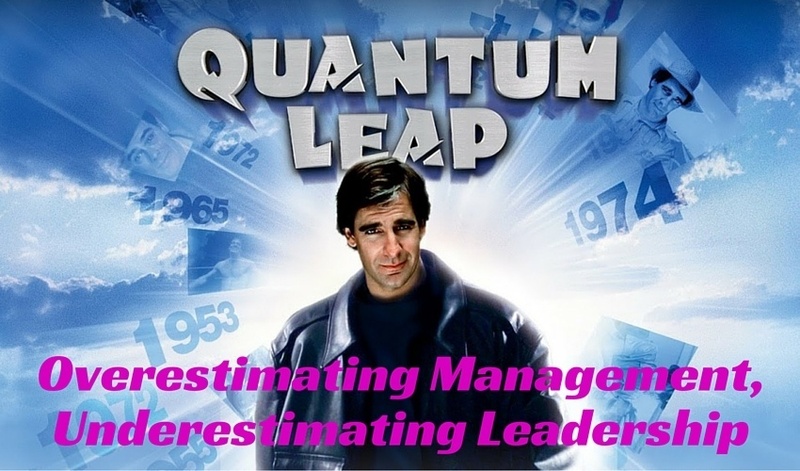 I didn’t watch it, but I know people who acknowledge that it was their introduction to the phrase, “quantum leap.” My earliest recollection of the idea came when a business owner I was working for wanted to see what I thought was a small increase in sales for a particular month. I did some quick math in my head and realized the goal could be met with just an extra sale or two from each member of the sales team. No big deal. I was a teenager. Early in my sales career I learned how deceptive it could be to calculate an increase based on an “if we only sell a few more of this and a few more of that” strategy. But that’s exactly how some companies target quantum leap sales growth. Sales is just one area of growth – likely the most important area for businesses. But it’s something different when you’re running a city government or some other organization whose work isn’t based on revenue or profit generation. It’s about getting things done efficiently and effectively. It’s about winning friends and positively influencing along the way, too. Those can be much harder to measure. Ask the sales manager with a product list about elevating sales. It’s easy to grab an account list and ask the troops to increase the sale of each SKU just a few units per month. Sounds reasonable. In fact, it can sound ridiculously reasonable. I mean, if a company is buying 10 of one SKU a month, how hard can it be to sell them 12 instead of 10. Come on! We just need them to sell 2 more. That’s nothing. Now, do that across the board with a list of 36 SKU’s and suddenly you may have taken a client from a $1 million a year level to $2 million. How did THAT happen? Man, alive. We only increased each SKU by 1 or 2 units. But those dollars add up. As reasonable as it seems, it’s completely unreasonable because your 36 SKU’s aren’t the only SKU’s sold by your client. They may or may not have the capacity for increasing the unit sales of your products. Maybe you’ve got a competitor who is selling better among some (or many) of those SKU’s. There’s more to it than merely asking a client to buy a few more of them, and a few more of that. Incremental increases in purchases by unit can result in quantum leap increases in dollars. It’d be great if our clients would just comply with our desires. Unfortunately, clients have their own needs and constraints. They’re not coming to work each day to make our dreams come true. They’re busy chasing dreams of their own. Some organizations overestimate managing all the moving parts. They spend an extraordinary amount of effort and time on tracking the measurables they think matter the most. I’m a big fan of data. The more, the better. Provided it’s accurate and provided the conclusions drawn are true. But asking a sales team to sell just a few more of each SKU is not only naive, it’s unreasonable. It shows a lack of leadership. We manage work and processes. We lead people. People get things done. Processes provide the vehicle to help people get things done. But a process sans the people isn’t productive. Even in robotics and manufacturing, people are the brains behind the process performed by the robots. Leadership addresses the why and how of it all. Why are we going to do whatever it is we’re planning? How are we going to do it? The fact that McDonald’s crafted a process to deliver fast food in a predictable, reliable way time after time was leadership. Leadership is also part of training people to follow that process religiously so the delivery is consistent all the time. Management ensures that the process remains intact. If the french fry machine is broken, the process breaks down. Management has to kick in to fix that problem. If the process isn’t broken, but an employee is failing to follow the process, leadership has to kick in to fix that problem. I’ve seen sales manager task their team with selling more. Do better. We need to increase sales 10% this month. We’re missing our projections. All the usual stuff of hard charging sales managers! No examination of the sales process. No leadership in answering the big questions of why and how. Just the admonition to do more. Do better! In my work to help leaders and executives become more productive I’m unable to detach people from the process. I’ve experienced more than my share of economic downturns, including the oil embargo of the 1970’s and the recent sub-prime mortgage debacle. When times turn hard, it’s common for organizations to look at cutting payroll. People are often the first thing to go when the going gets hard. For good reason. People are expensive. Especially in a day when benefits comprise 30.5% of total wages (US Dept of Labor numbers). That means if you shave 70 cents in payroll, you basically automatically shave another 30 cents in expenses for benefits. And if you don’t have to look people in the eye, it’s easy. What’s hard is generating another buck! Harder still, dropping another dollar to the bottom line profits! Even harder is finding ways to save money in processes, but the great companies learn how. See Southwest Airlines who for years have hedged their bets with fuel costs savings. It’s that whole putting things on trial for their life that I talked about in episode 266. The people side of enterprise is commonly referred to as “soft skills,” but I think it’s anything but. It’s hard. Sometimes it’s hard because it’s tough to measure. Harder still for some to be objective. And it’s personal. It’s not some inanimate thing like a procedure or a process. You can sell an asset – like a truck or a building or equipment. Easy. You can lower inventory by not spending as much (but you may risk lowering sales, too). But people? It’s anything but easy or soft. But people can be among the most profitable resources available to you. Because people make decisions, have ideas and solve problems. They make THE difference. That’s why I emphasize leadership without minimizing management. Both are important, but people are the ones who dream up, create and implement the ideas and processes. And when things break – as they are wont to do in every organization – it’s people who fix it. Sometimes the “it” they fix is themselves and their own performances. I know I promised an episode on evidence-based leadership with this episode, but frequent discussions about leadership in recent weeks have compelled me to postpone it only so I could set the stage with how importantly I view people. It’s a critical piece of the puzzle when we’re sitting down at the kitchen table to assemble the 100,000 piece jigsaw puzzle that is LEADERSHIP. Data cravers want to dissect numbers and measurable metrics. Don’t misunderstand. I love the measurables, but I’m suspect of those who claim, “The numbers don’t lie.” People don’t always interpret the numbers or data correctly. Conclusions aren’t always accurate. Watch any NFL game and you’ll see numerous instances of replay that are still subject to rule interpretations. The quality of the people – the officials reviewing the replay – make all the difference. I suspect the same is so in your organization. The best performers increase knowledge and wisdom. Their experiences serve to make the organization better, provided they’re committed to learning. Always learning. That’s the key to improvement. What can we do to be better? How can our organization improve? The answers aren’t easy, or simple. But they’re doable. Every product, process and workflow can be improved. Sometimes things just get too complicated and we overthink it. Have you ever looked at something your organization is doing and thought, “That’s just more sophisticated than it needs to be?” I’m guessing we all have. Sometimes smart people just worry too much about looking smart. Effective and efficient are frequently just plain simple. About 10 years ago I purchased a Dyson vacuum cleaner for my wife. Yeah, I’m that kind of a husband. A real romantic! Well, I bought into the marketing that was (and still is) Dyson. I didn’t do much shopping. They looked cool. The marketing sold me on the technology. So I bought one. No complaints. The thing had more contraptions and attachments than the NASA space shuttle. It was magnificent. She was happy. It’s served us well for a decade now. But recently it started giving us some problems. Suction wasn’t good. Multiple little issues nagged us. So I set about to find her a new one. Unlike before, I decided this time I’d rely on some expert opinions. I visited with cleaning professionals. I visited websites filled with reviews. I looked at dozens of different models. In the end, those cleaning professionals – the people who vacuum for a living – persuaded me to take a look at Oreck. The odd thing is I didn’t give Oreck a second glance a decade ago because of what I perceived was hype. Talk about a contradiction. I bought Dyson purely because of marketing, but I avoided Oreck because of perceived hype. And I’m a logical, smart guy. Proof that any of us can be goofed up in our quest to make an evidence-based decision. How could the Oreck be as good, or better, than a Dyson. The Oreck costs half as much. It’s got no attachments. It’s so old-school. Besides, you have to replace the bag and it’s got a belt drive. Isn’t baglesss and no belt a better way to go? No, said the professionals I talked with. No, said the vacuum repair shops. The Oreck is basic. Simple. Straight-forward. The beater bar spins at 4000 to 6500 RPM, driving by a belt. The distance between the beater bar and the bag is mere inches. It’s a straight shot. The thing is minimal. It weighs 8 pounds. The Dyson feels like you’re pushing a car once you’ve pushed the Oreck. Brand new, the Dyson never cleaned the floors half as well as the Oreck. Who’d a thunk it? All the fancy circular dust swirling around the Dyson bagless dust container. So many pieces and parts and all that sophistication. Well, scrap all that. How about we make something lightweight, simple and easy. Something that just happens to cleans floors as well as anything you could fly in space! Hello, Oreck. I’m talking to YOU. Don’t confuse sophistication with effectiveness, or efficiency. I’m sitting across a business leader not long ago and we’re talking about some of his people problems including finding great talent. Talk turns to performance and getting things done. At some point we chuckle at how simple we both view the problem of some existing team members. “Is it really any more complicated than just doing your job well?” I ask. He agrees that that about sums it up. Easier said than done though. If you do your job well it’s no guarantee you’ll have a successful career. It could be your job will become obsolete. It could be the job will be replaced by a machine or some lower cost talent. But it could also be that your job needs to re-engineered. The process needs to be revamped. You doing the job well doesn’t mean the process – the actual work you perform – is best done the way you’ve been told, or the way your performance is judged. The blacksmith may have been the best on the planet, but obsolescence took away his opportunity. So just doing your job well isn’t really enough. It’s also about improving the job, finding ways to get better or ways to make things better. It’s that human touch that makes YOU valuable. Dyson may be taking a backseat only to Hoover in marketshare (last I looked), but Oreck is the new market leader in my house. Maybe it’s about doing your job well (Oreck) or maybe it’s also being able to tell your story better (Dyson). Bells and whistles often trump doing the job well though. It’s true in vacuum cleaners. It’s also sometimes true in the workplace. That’s just another reason why evidence-based leadership is important. Things aren’t always as they appear. The person who claims credit for the idea may not be the person responsible. They just might be the boss, better poised to claim credit. The person doing their job well may be viewed unfavorably because the direction given was bad. But they were being the good, dutiful soldier intent on doing their best even if they disagreed with the marching orders. They marched. And well. See, it’s a dirty, nasty business – this business of leading people. How can we determine who those best people are, and what seats on the bus they should occupy so we get the bus where we want to go? These are difficult challenges made more difficult by the murky water we’re often caught swimming in. Budgets, committees, customers, vendors, financial partners, corporate politics, culture, competitiveness, cooperation, demographics — these are just a few of the many variables facing us every day when we arrive at the office. We don’t do our work in a vacuum. Even our vacuum cleaners are subject to the elements. Doing our job well, as leaders, isn’t about being right all the time. That’s impossible. It’s about getting it right more often than not. It’s about seeing when we get it wrong faster than others. It’s about our willingness to own it, fix it and get on with it. It’s also about making sure we focus on the people doing the work because I’ve still never been able to uncover a reason for leadership’s existence if you remove the people. That’s when we just need pure managers. People need leaders. Processes need managers. 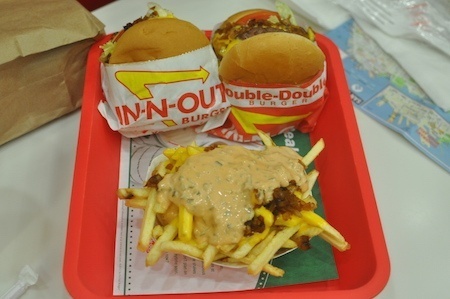 The speed with which In N Out serves food is largely dependent on the process. They have a workflow. It’s important that employees are trained and held accountable to maintain that workflow. Can the workflow be improved? Of course. Things can always be improved. But people have to execute the process or customers get angry. And if the process is going to be improved, it’s likely going to come from the people working the current process. They’re going to figure out some slight tweak, or maybe some large revamp. Somebody is going to come up with something. The process will make the difference, but the people will improve the process. That’s where the quantum leap will happen. Figuring out a better way happens when people engage their brains and think. Brain power. Creativity. Problem solving. That’s why my work focuses on people. Because they’re the catalyst behind improvement. People fix the problems. They find better ways. Great leadership fosters all the qualities we most need in our organizations. Great leaders make a big difference not because of their own work product, but because of the work product of the people they lead. They knock down roadblocks and speed bumps that prevent their people from doing their best work. They remove the bureaucracy and other constraints that bog down their people. They fight to free their people to do their very best work. So rare are these opportunities that even the novice workers recognize when leaders are letting them soar with the wind of innovation and good thinking. Nothing trumps great leadership for employee engagement. Nothing.